Shouldn't really be here but I find them in my beehives all the time. In the narrow gaps around the edges. They don't appear to do any harm and the bee inspector wasn't interested in them last year and couldn't name them either. Can you make it out? It's some kind of caterpillar/grub in a peach coloured case. Looks like greater wax moth & the damage to the comb adjacent also. No major threat just remove them when you find them. Thank you! I've always removed them and not noticed any major damage in any of the hives. I'll continue to remove them! 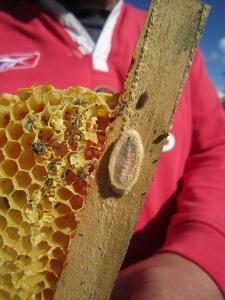 Wax moth are more of a problem with stored comb. They will got through it and just leave dross.